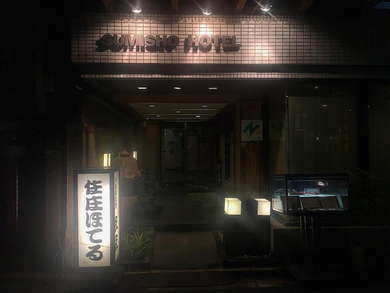 Though it doesn’t refer to itself as a ryokan (traditional Japanese inn), the Sumisho Hotel has more in common with it’s traditional counterparts than your run-of-the-mill hotel. There are an array of uniquely Japanese touches throughout the property, small rock garden, tatami floored rooms, and it’s very own Japanese bath for men and women. Budget-conscious travelers will love the quiet and historic neighborhood, authentic living style, and delectable restaurant. Rooms come in both western and Japanese style. Western rooms are as basic as they come – small quarters, small TVs, and small beds. Japanese style accommodations have tatatmi floors, shoji screens, and rolled up futons. All rooms come with yukata pajamas – but you’ll be charged if you take them home with you. If you want to switch out your pillow, the hotel also has buckwheat options (they take some getting used to). Miniscule bathrooms have shower/tub combos, Toto toilets, and a variety of free amenities like toothbrushes and razors. There isn’t really a lobby, just a check in area and a throughway to the hotel’s Japanese baths. Large, communal Japanese baths are available for men and women. If you’re unsure how to follow Japanese bathing etiquette, don’t be shy and ask for help at the front desk. Or you know, just Google it. Kappo Sumisho serves authentic Japanese cuisine for breakfast, lunch, and dinner and has both western and Japanese style seating arrangements. The hotel prides itself on its painstaking collection of the best ingredients in Tokyo. The hotel is in the historic center of Nihonbashi – the spot in the 1600s where Tokyo became the capital of Japan. With that distinction, there a number historic sites in the immediate vicinity that are all within walking distance. The nearest subway is also a 5-minute walk away. If you want a great sampling of every Japanese cuisine possible, head down to the basement of the Mitsukoshi Department Store (8-minute walk) where you’ll discover dozens of merchants serving up everything from sushi and tempura to soba and yakitori. The hotel isn’t too far from Tokyo Station (15-minute walk) where you can find tons of great bars like Bar Oak inside the Tokyo Station Hotel. Here you’ll have access to some of the best whiskey in all of Tokyo. Part hotel, part ryokan, Sumisho plays in both western and Japanese worlds at a price point any budget traveler will love. There aren’t too many amenities here and western rooms (especially) are pretty drab, but the restaurant serves exceptional Japanese cuisine and the communal baths are refreshing and energizing. Location-wise, the hotel is in a nook that harkens back to the history of Tokyo itself and is close to major attractions and monuments.